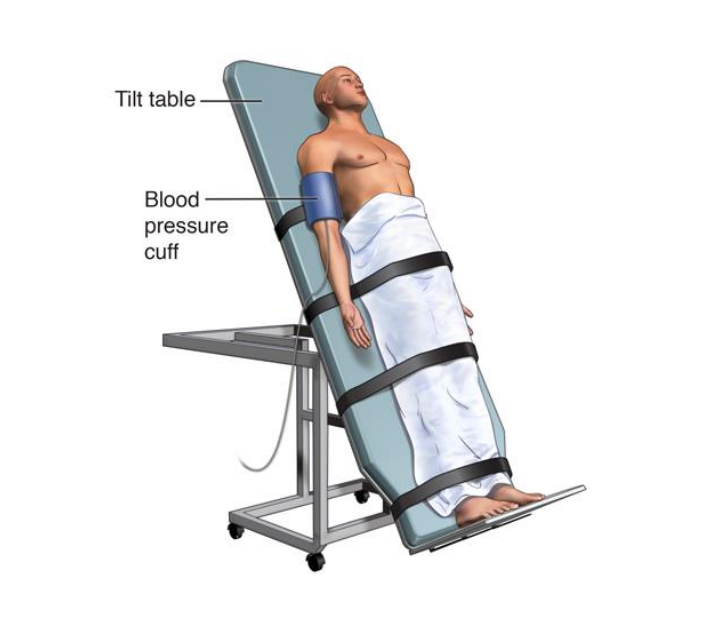 Tilt table testing is carried out to aid in diagnosing the cause of fainting or near fainting episodes. The purpose of this test is to see if your symptoms are related to your heart rhythm and/or blood pressure. During the test, you will be attached to a heart monitor, a blood pressure monitor and a monitor that watches the amount of oxygen in your blood. You will have an intravenous started and lie on a special table. You will be flat at first and then you will be tilted upright. During the test you may receive a medication through the intravenous which increases the heart rate (similar to caffeine). Do not eat or drink for 4 hours prior to test. Your cardiologist will tell you if you should take your medication. Please arrange to be picked up after test. This test will take approximately 2-3 hours.